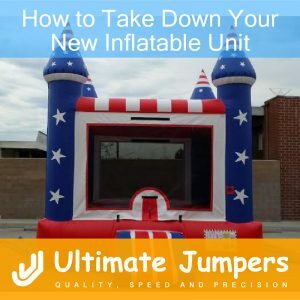 After setting up your new unit from Ultimate Jumpers, Inc., let’s look at how to take down your new inflatable unit. 1. Once the unit is done being used, unplug the blower and open the air flow zipper(s) for quicker deflation. Some units (mostly larger ones) will have more than 1 air flow zipper. You may also step onto the unit to speed up the process. 2. You can start folding the unit into 1/3. Once you have it folded, start rolling the length as tightly as possible from one end to the other. You might require some help from others. After it has been rolled up and tied down with the straps, you can stand the unit up onto the ground or dolly to be moved to a desired location or vehicle. We recommend using the storage bag for transport and storage. 3. Clean the unit before putting it away. If you cannot clean before folding,In you can always clean it before the next set up or before/after storage. Our staff is always available to help with any questions regarding how to take down your new inflatable unit. Feel free to give us a call anytime as assistance is needed at 1-800-219-9211.